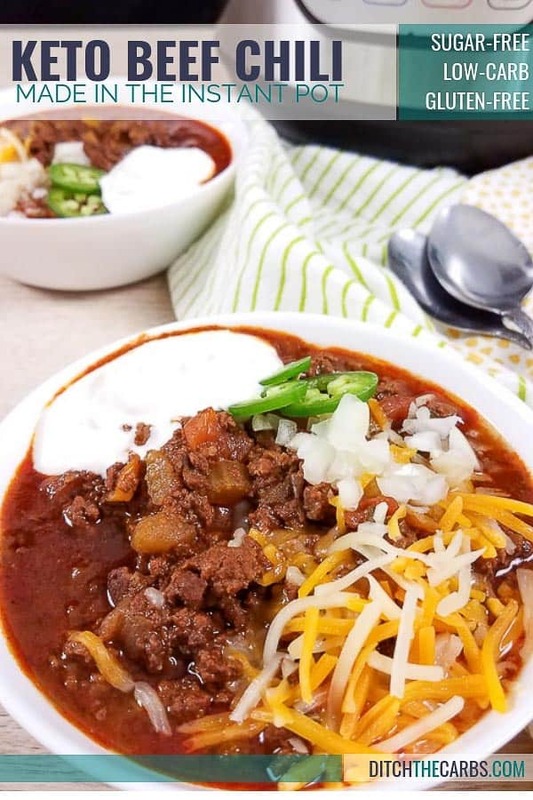 This Keto Instant Pot Beef Chili is worthy of any chili cook-off. 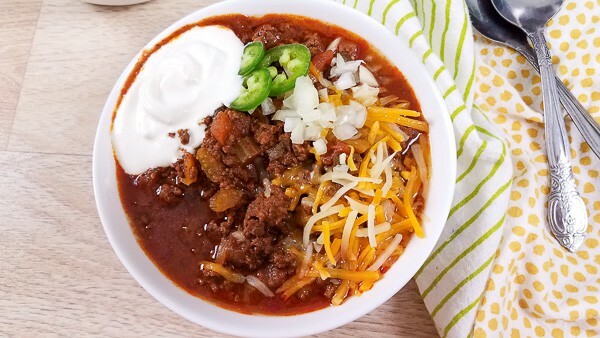 This keto chili is packed with so much goodness you won’t even miss the beans. 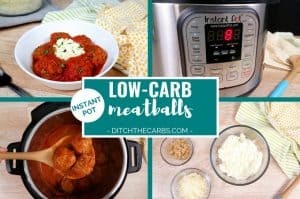 At only 7g net carbs per serve, it will keep you full, keep you warm and keep you on track! 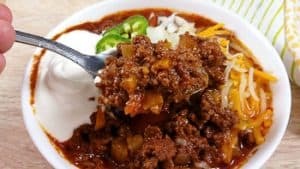 If you are a chili lover this keto chili is going to blow you away. We took out the traditional beans found in chili and replaced them with delicious low-carb vegetables that compliment the chili flavours. That way you don’t eat just a bowl of seasoned meat. 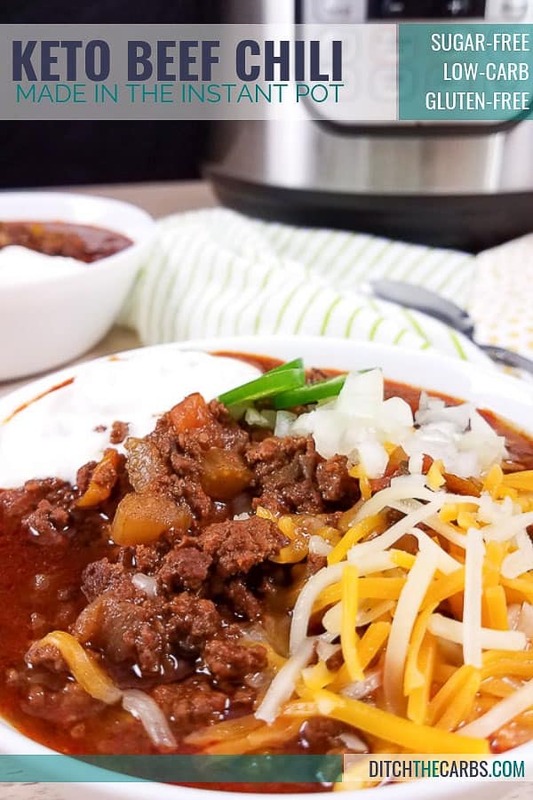 This chili is made in the Instant Pot, but you could easily convert the recipe to be cooked in a slow cooker or on the stove. 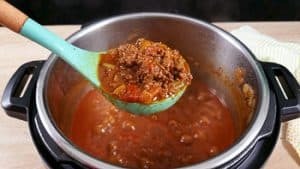 Chili is usually cooked for long periods of time to allow the flavours to fully blend. 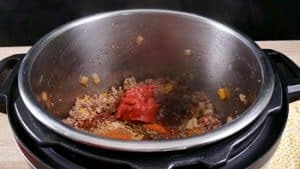 However, in the Instant Pot, you only need to cook this chili for 35 minutes with a natural pressure release of at least 10 minutes so that it doesn’t sputter and splatter all over the place. You’ll find plenty of low-carb vegetables in this chili. Celery, yellow bell pepper, fresh tomatoes, and jalapenos mix perfectly with the chili to provide extra nutrients to the meal. I warn you this chili packs quite the kick. A large part of the flavour in this chili comes from sautéing the onions, garlic, bell pepper, and jalapenos. 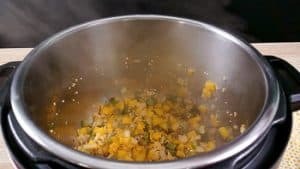 The vegetables start to caramelize, and then the Instant Pot insert is deglazed while the ground/minced beef browns. If you have a low tolerance for spice, you may want to cut the jalapenos in half or out completely. 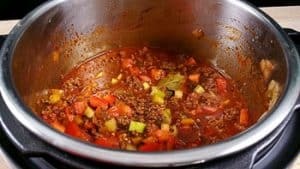 After the ground/minced beef is browned it is mixed together with a blend of homemade chili seasoning, beef stock, tomatoes, celery, and coffee. You read that correctly. Add that leftover cold coffee from the morning into your chili, you won’t regret it. Saute onions, bell pepper, jalepenos, and garlic. Brown the beef and drain the grease. Add chili seasoning, tomato paste, and worcstershire. Add beef stock and coffee. Cook for 30 minutes with a natural pressure release for at least 10 minutes. In this chili, I used a small amount of gluten-free Worcestershire sauce. Not all brands of Worcestershire sauce are gluten-free, so make sure you read before purchasing. If you would rather avoid the Worcestershire sauce you can replace it with coconut aminos for a similar flavour in your chili. 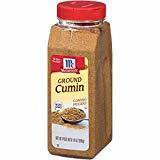 You may also choose to drain your ground/minced beef after it is browned, but before you add the seasonings. This step is up to you and what you prefer. If you forget to drain the grease before you mix in the seasoning, you can always scoop the grease off the top with a ladle after it cooks. Removing the extra fat at this stage isn’t about cutting back on fat (we are low-carb/high fat after all) but it’s about ensuring the sauce is thick enough at the final stage. 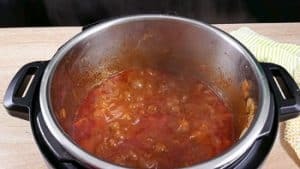 To thicken your chili you will want to reduce the liquid by simmering it on sauté mode in the Instant Pot. 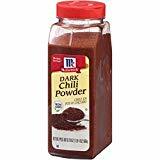 If you are low on time you could also thicken your chili using a thickening agent of your choice. For this recipe, I chose to reduce the liquid. The toppings you choose are just as important to the chili flavour as the ingredients. So don’t be afraid to load it up with a variety of fresh toppings. 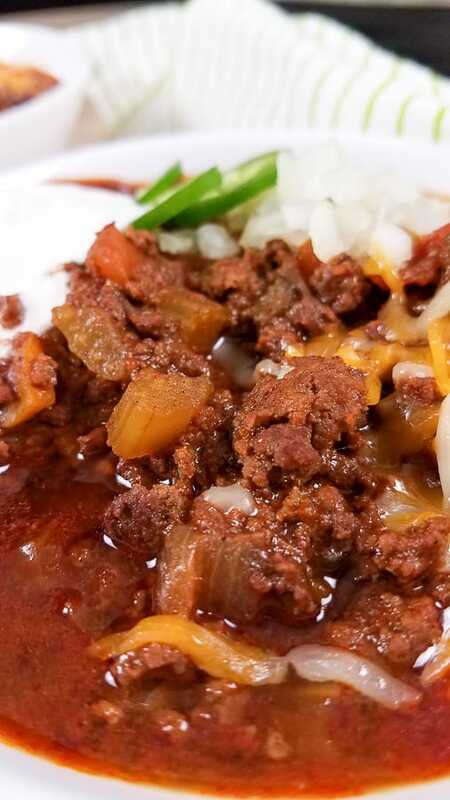 I love to top my chili with diced onions, sliced jalapenos, cheese, and sour cream. Yummmmm. 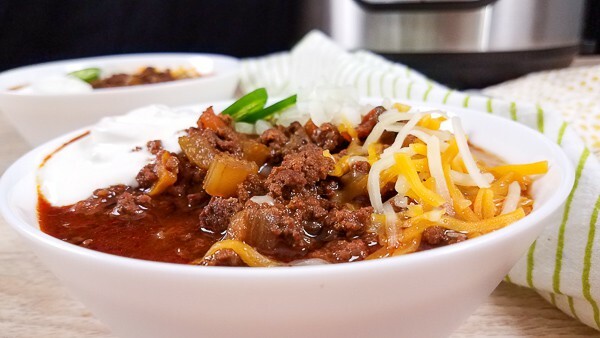 Some other toppings that you may enjoy on your chili are chopped cilantro/coriander, lime wedges, or even finely sliced cabbage. 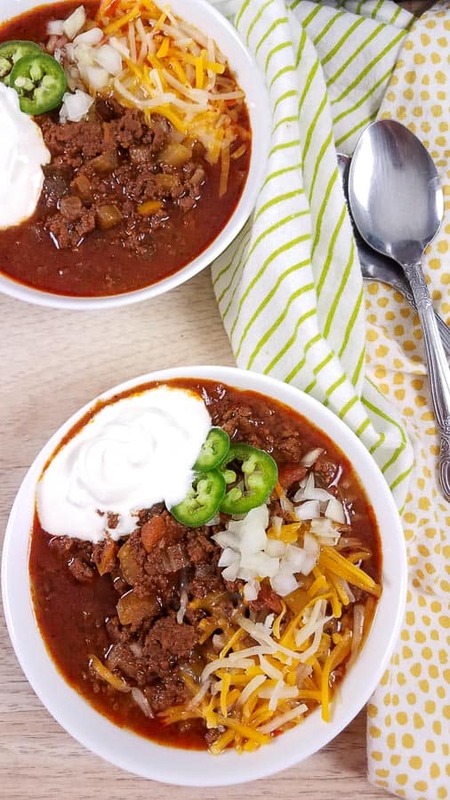 I know it may sound a bit odd to put sliced cabbage on top of your chili, but it adds great texture and volume to the chili. 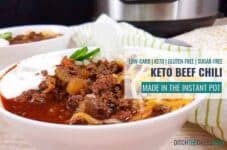 Our Keto Instant Pot Beef Chili is full of flavour and delicious low-carb vegetables. 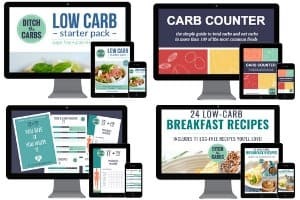 it's a healthy family recipe packed with nutrition. 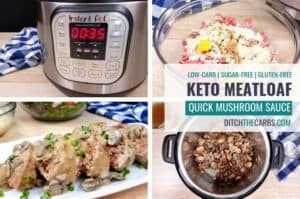 Turn the Instant Pot to saute mode. When the Instant Pot is hot, toss in the onions, jalapenos, bell pepper, and garlic. Saute for 3-5 minutes until it begins to soften and brown. 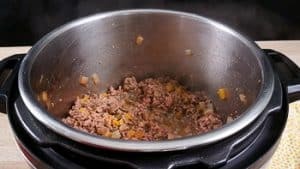 Add the ground/minced beef to the Instant Pot. Use a spatula to break apart the meat and brown it. When the beef is browned drain the grease if desired. Next mix in the chili seasoning, tomato paste, and Worcestershire sauce. Dump in the diced tomatoes, celery, broth, and black coffee. Give it a quick stir and then close the lid, turning the pressure valve to sealing. Cook the chili using the "bean/chili" function, "manual", or "pressure cook" functions for 30 minutes. Let the pressure release naturally for at least 10 minutes before doing a quick release. This prevents the chili from shooting out the top. 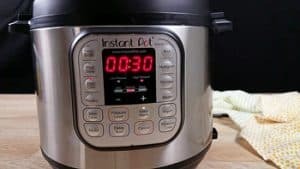 Remove the lid and turn the Instant Pot back to saute mode. Allow the chili to simmer with the lid off until the liquid is reduced and it reaches your desired thickness. This could take between 10-20 minutes. 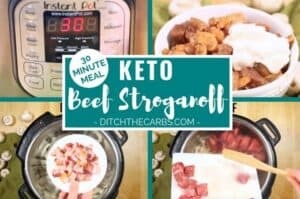 If you are in rush, sprinkle in a tablespoon of your favourite keto friendly thickener. Serve while still hot topped with cheese, sour cream, onions, jalapenos, and maybe even some chopped cabbage. Enjoy! This chili is cook off worthy! Wow this is good. Didn’t want it too spicy so just had the jalapeños and no extra chilli powder or cayenne pepper. It was lush with sour cream and shredded tasty cheese. 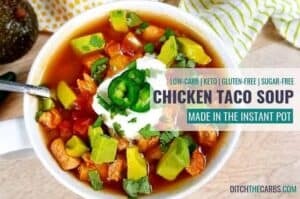 Are the 660 calories PER serving or total for the recipe? All nutrition panels are per serving. Why do so many ‘bloggers’ refer to the ‘traditional beans’ in chili? Traditionally, there are NO beans in chili!! There are theories where that travesty began, but they just aren’t traditional or authentic. Go to any legitimate chili cook-off and see. I have never used a stove top so can’t give you my personal experience, but as long as it pressurises like an Instant Pot, it should work. The chili sounds incredible. I don’t have an insta pot. 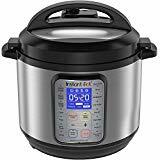 What is the final cook time for a slow cooker. I would cook this on LOW for 4-6 hours or HIGH for 2-4 hours. Remember to stir it halfway through to ensure all the flavours blend beautifully.